There is something truly remarkable about diamonds. Even after working in this field for many years I can't explain the phenomena. A diamond stands alone as the most cherished of stones. It symbolizes love, romance and commitment. It's a girl's best friend. It can be worn day or night, with any outfit, it's never out of place. It's the perfect gift for an engagement, anniversary or just because, "I love you". 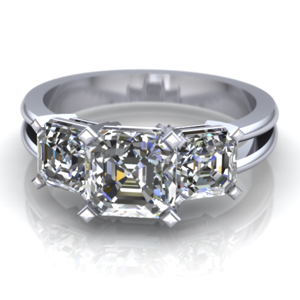 We often begin our discussion of diamonds by listing the 4 C's, Carat, Color, Clarity, and Cut. Unfortunately, these characteristics are often misunderstood. The Diamond Promotion Service, in an attempt to improve communication, devised a four sided triangular visual aid. Carat is listed on one side. Color, clarity and cut are listed on the three remaining sides. The point of the visual aid is to explain rarity and how it affects the value of a diamond. Diamond with a tint of yellow color and relatively common as well are gemstone with numerous inclusion. Large diamonds are quite rare. Diamonds over one carat are one in a million. Putting all this together a large diamond, with little or no body color and very small inclusions is very rare and correspondingly will demand a higher price in the marketplace than a more common specimen. That's where most discussions end. 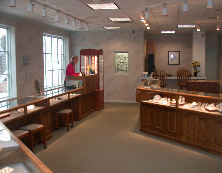 We have talked about three of the 4 C's and most people think they know all they will ever need to know about diamonds. That's not the case, before we can determine value we need to explore the fourth C, Cut.